At 8:45 PM Friday night, the BepiColombo will lift-off from French Guiana on its long journey to Mercury. The European and Japanese Space agencies have been working on this project for the last 10 years, in order to better understand our solar system’s least researched planet. 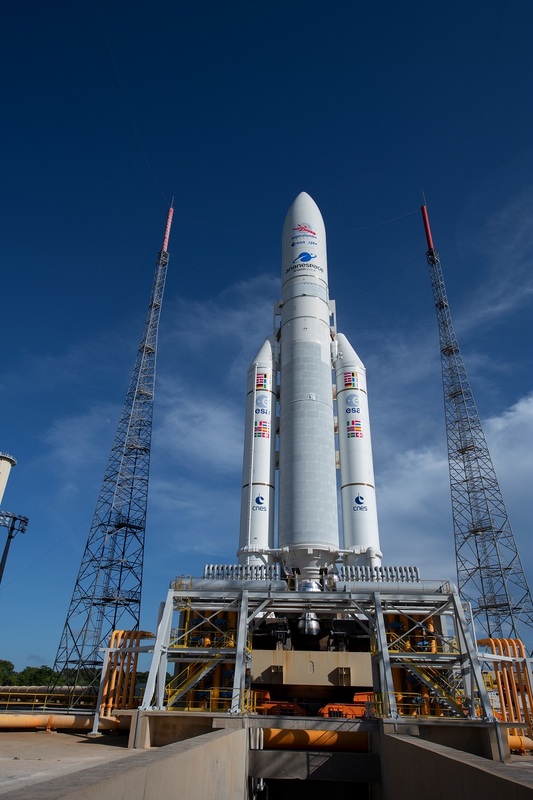 The spacecraft will be launched onboard an Ariane 5 rocket, the heaviest launcher in the European Space Agency’s Ariane rocket family. Image: The BepiColombo Ariane 5 rocket on the launch pad at Europe's Spaceport in Kourou, French Guiana. Image Credit: ESA - S. Corvaja. It is necessary to use the heaviest rocket, since BepiColombo is actually two separate spacecrafts, the Mercury Magnetosphere Orbiter (MMO) and the Mercury Planetary Orbiter (MPO). The MMO, designed by the European Space Agency (ESA), will be investigating the magnetospheric interactions between the planet and the solar wind that is ejected from the Sun. The MPO, designed by the Japan Aerospace Exploration Agency (JAXA), will be put into a lower orbit in order to provide remote sensing of the planet’s surface – mapping the terrain, generating height profiles, sense the interior, and gather data on structure and composition of the surface. Image: The unpacked payload stack of BepiColombo as it reaches Mercury. 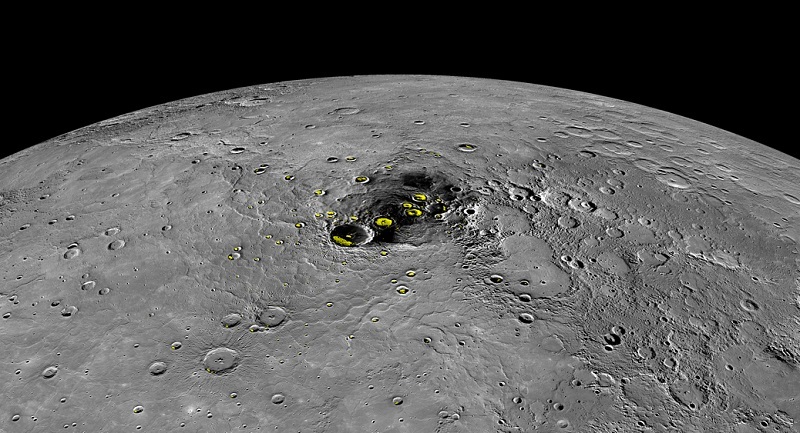 The biggest challenges of this mission is Mercury’s obvious proximity to the sun. At just under 36 million miles away, temperatures can reach up to 752°F in direct sunlight. Mercury’s nearly non-existent atmosphere also means that the planet itself will be giving off extremely hot temperatures, pinning the obiters in a “heat sandwich” for most of their lifespan. Attempting to reach the closest object to the largest object in our solar system is also a very tricky situation, one that will take 7 years to complete. It would only take a couple months to travel from Earth to Mercury on a straight line, but because of the sun’s deep gravity well, a more circuitous route is necessary. This route will take it on flybys of Earth, Venus twice, and Mercury six times before dropping into Mercury’s orbit. Normally if going outward in our solar system, these planetary flybys would speed up the spacecraft, but for BepiColombo, it is for braking. This slowing down of the spacecraft is needed, or it would be captured by the sun’s strong gravitational pull and careen into our closest star. Image: Animation visualizing BepiColombo's journey to Mercury. 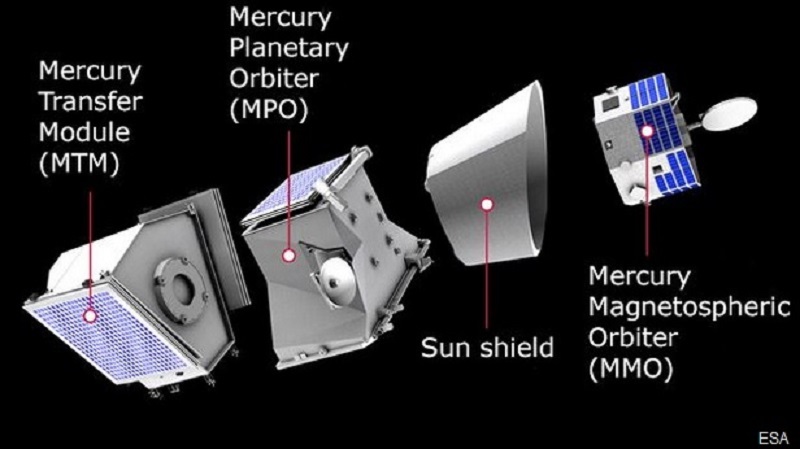 BepiColombo will be only the third spacecraft to have ever orbited Mercury, the first being Mariner 10 in 1973, and Messenger in 2011. Mariner 10, being the first, was the first spacecraft to ever use the “gravitational slingshot” maneuver. This maneuver, inspired by the orbital mechanic calculations of Giuseppe Colombo, used the sun’s orbit and the gravity of another planet to alter the path and speed of a spacecraft. This maneuver allowed Mariner 10, the last spacecraft in the Mariner program, to conduct three flybys of Mercury’s surface. Through this mission, it was discovered that the atmosphere primarily consists of helium, that the planet has a magnetic field, and a large iron-rich core. It was also determined that it rotates as it orbits the sun, in fact, rotating once on its axis every two orbits around the sun. This means that a day on Mercury lasts two years, or 176 Earth days. The Messenger mission, named after the Roman deity Mercury - who was the messenger of the gods, discovered large amounts of water in Mercury’s exosphere, past volcanic activity, and a liquid iron planetary core. It also fully mapped the surface of Mercury, and discovered that ice exists year-round in craters near the planet’s poles. Image: An orthographic projection view of the northern pole of Mercury taken by the Messenger spacecraft. The yellow regions indicate evidence for water ice. Understanding more about the least understood, and closest planet in our solar system to the sun, is key in learning the origins of our solar system. The mission of BepiColombo is simple, to figure out Mercury’s history. It is possible that Mercury began life much further from the sun, and migrated inwards, likely colliding with objects on its way. This does not fall in line with the abundances of Sulphur and potassium compounds at the surface, which should have been burnt off during impacts with large objects. Mercury is also shrinking, but why? As temperatures increase, expansion should be occurring in and on the planet’s surface. Several questions still evade scientists, but with the help of BepiColombo, those questions are soon to have answers.